We’re feeling giddy. Why? Maybe it’s the fact that the thermometer finally stopped hitting triple digits. Maybe it’s because hockey season is about to start again and the Vegas Golden Knights are looking solid coming out of preseason. Or maybe it’s because we peeped the fall concert lineup at The Cosmopolitan of Las Vegas. Someone needs to give their booking agent a raise. And give us one, too, because we need more money to buy tickets to all of these shows. Is there a band cooler than Garbage out there? Don’t bother answering, because no, there is not. Led by fiery Scottish singer and fashion icon Shirley Manson, Garbage dominated the 1990s airwaves with its innovative blend of electronic grooves and clashing guitars on such songs as “#1 Crush,” “Stupid Girl,” and “Only Happy When It Rains.” Thanks to the group’s future-forward musical (and visual) style, Garbage’s songs sound as fresh today as they did in the Clinton era. And if you can find a ticket for the band’s show at The Cosmopolitan during the Version 2.0 20th Anniversary Tour, you can confirm that for yourself. 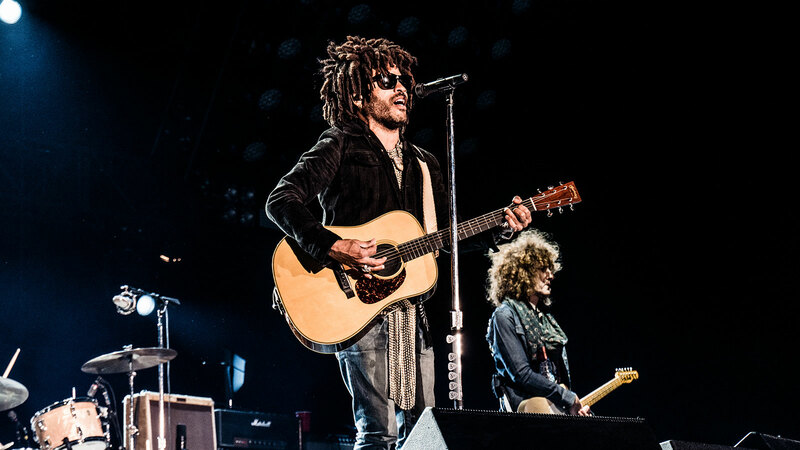 We sort of hate Lenny Kravitz. Yeah, that’s right. We hate him because he’s a musical chameleon who can play just about any instrument in any style. Because he’s managed to stay relevant for more than 30 years—and look cool doing it. Because in that time, he hasn’t aged a friggin’ day. Because he owns some of the greatest pop culture collectibles ever. And because his songs remain timeless gems, whether we’re talking about the retro-soul of “It Ain’t Over ’til It’s Over,” the riff-rocking rawness of “Are You Gonna Go My Way” or the irresistible groove of “Fly Away.” OK, fine, we hate him because he makes it impossible to hate him. Grr. We got a little nervous when Willie Nelson had to reschedule his January shows at The Chelsea due to illness. At 85, it’s a blessing just to have Nelson still churning out top-charting albums, let alone touring the United States. But thankfully, the shows got rescheduled, and for two nights, Willie is bringing his family with him to The Cosmopolitan—including his eerily sound-alike son, Lukas, who made Rolling Stone’s 2017 Hot List. So not only do you get to witness a legend live in an intimate setting, but you also get to be there at the start of what appears to be an epic career of its own. Honestly, we’re not even sure tickets are still available. Although June is nationally recognized as LGBT Pride Month, here in Vegas, Las Vegas PRIDE has been an October tradition for as long as we can remember—probably because, let’s face it, June isn’t the best time for an outdoor festival and parade in the middle of the Mojave Desert. This year, following the first day of the PRIDE Festival, The Cosmopolitan will host the official PRIDE After Show at its fabulous Boulevard Pool, featuring headliners Superfruit and Betty Who, with support from local booty-shakers GoldBoot. The entire resort is getting into the spirit, with the iconic Chandelier bar lit in rainbow colors throughout the weekend, and special PRIDE cocktails available both there and at the PRIDE After Show. Lea Michele and Darren Criss are not Rachel Berry and Blaine Anderson. But, they are two titanically talented triple-threats—not unlike their Glee characters—who have found success on stage, screen, and record, so you’re forgiven for confusing them. You won’t be forgiven, however, for missing them together on stage at The Chelsea, where they’ll perform songs and share stories from across their respective and collective careers. And you’ll likely be singing along the whole time. Just like you did for six seasons of Glee. It’s going to be an intense night of music when hip-hopper NF and alt-pop group Nightly take the stage at The Chelsea on Nov. 10. On songs like “WHY,” “Lie,” and “Let You Down,” NF delves into his real-life struggles, including child abuse, anger issues, and parental loss, while Nightly’s melodic, story-driven songs are delivered with such passion and youthful energy, there’s inevitably going to be a lot of sweat and tears left on the stage when they’re all done. And probably in the stands, too. The term “supergroup” gets thrown around a lot. The notion of taking players from different successful musical acts and putting them together into one mega-act is nothing new—it’s been happening ever since Eric Clapton, Ginger Baker, and Jack Bruce formed Cream in 1966. But A Perfect Circle is different. Formed by Tool singer Maynard James Keenan and multi-instrumentalist Billy Howerdel in 1999, the duo has become the nucleus around which an ever-shifting lineup of modern rock’s greatest players revolves, including members of Smashing Pumpkins, Queen of the Stone Age, and Marilyn Manson. As if that isn’t enough incentive to make sure you’re at The Chelsea on Nov. 18, A Perfect Circle is also bringing genre-defying rapper-producer Tricky along for the ride—and it’s guaranteed to be a wild one. Is 2018 the year of Brockhampton? It sure seems that way. The self-described “boy band” is really more of an avant-garde pop-rap collective, whose live shows feature immersive multimedia, orchestral strings, and kids generally losing their minds. The previously independent group signed a deal with RCA Records this spring, resulting in the chart-topping release of its major-label debut, Iridescence. And last month saw the limited release of a new documentary about the group’s rise, The Longest Summer in America, which doesn’t shy away from the trials and tribulations faced by the boys throughout the year. All that is to say, anything can happen when they make their debut at The Chelsea on Dec. 6. You won’t want to miss this.